Introducing Salesforce Essentials, the new path to small business growth. Twitter is one of the biggest and most important social media platforms for businesses and entrepreneurs. It’s a great place to share links and updates, touch base with contacts, and grow your reputation as a thought leader. Its bite-sized posting format makes it perfect for busy people, which is one reason why so many in business — from CEOs to aspiring entrepreneurs — love the platform. 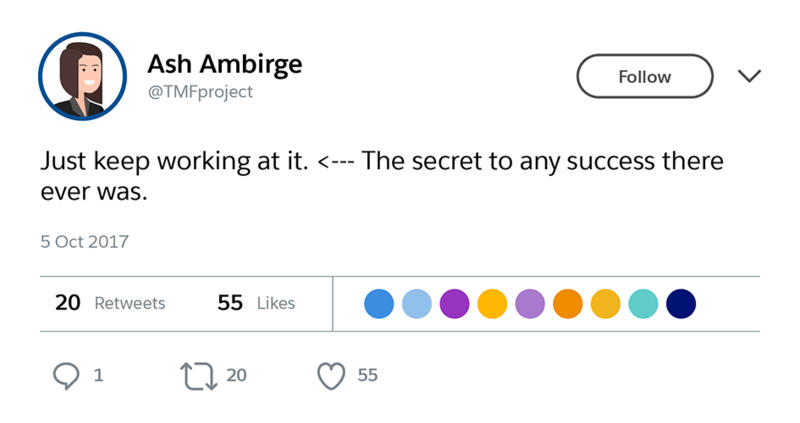 If you need some inspiration for your company, department, or within your own career, look no further: Here are 13 of the best recent business-related tweets. At the end of the article, you’ll also find some information on tracking down and connecting with industry leaders on social media. She’s a bestselling author, a popular speaker, and a respected researcher: Brené Brown is on a mission to help people be more authentic. 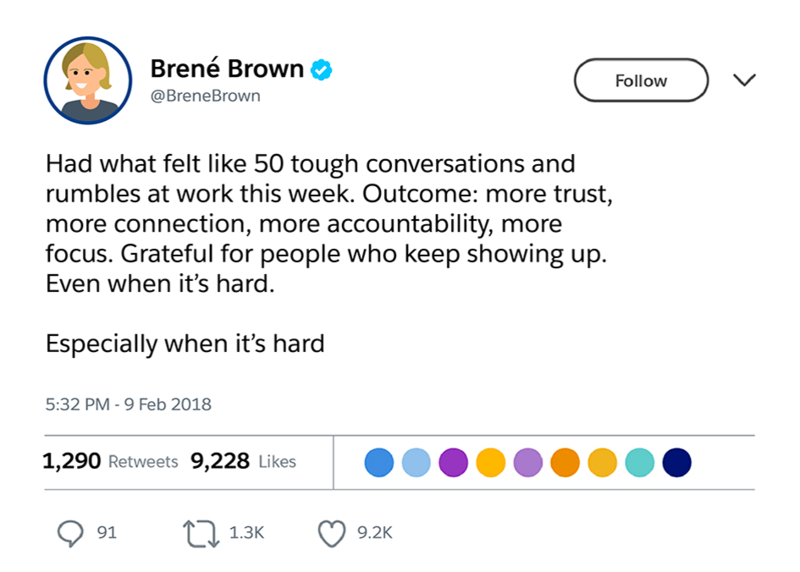 With this tweet, Brené reminds us that in order to grow a company, employees must be willing to have difficult conversations. These conversations can help employees and managers do better work, have a better working relationship, and feel integral to the company’s success. Companies with satisfied employees generally have happier customers, too. David Cancel, the CEO of Drift, a company that provides calendar software for busy businesspeople, reminds us that change is constantly happening, especially in the business and marketing world. What works one year may not work the next. Furthermore, consumers don’t just expect companies to keep up with change — they demand it. Business owners must make it a priority to stay ahead of trends in their field, and even more importantly, they must be willing to make changes within their own companies to keep up with the times. Old methods won’t work forever, and for a business to survive long-term, the people at the helm need to understand how to drive adaptation. As a writer and speaker recognized by Oprah Winfrey, Gordana Biernat helps people realize their full potential. 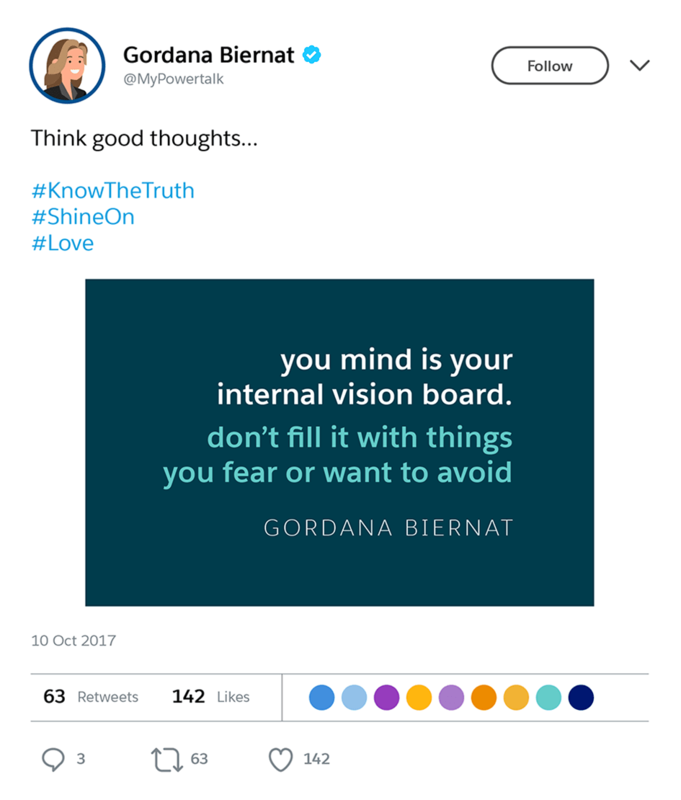 With this tweet, she shares an excellent metaphor that conveys the power of positive thinking. Business leaders serve their customers better when they focus on moving in a positive direction. Fears and concerns run rampant in business, but acting on them isn’t what will make your company better. Envision what you want your business to look like and what makes your customers happy, then push toward those goals. 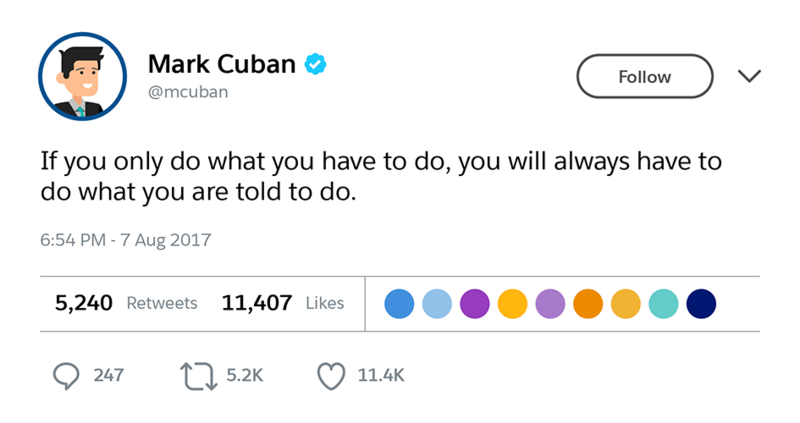 Mark Cuban is a well-known businessman and investor who’s known for speaking his mind. With this tweet, we’re reminded that going the extra mile isn’t so “extra” anymore if you want to be truly successful in business. You might be able to get by if you put in the bare minimum, but you won’t grow. Whether you’re an entrepreneur or an employee, give your work everything you’ve got if you eventually want the ability to call your own shots. A real-estate tycoon known for investing in startups, Barbara Corcoran understands the pressures of high-stakes business. It’s common for business owners to feel like they have to follow some set of external rules to succeed. Often, this feeling is a result of working as an employee at someone else’s company. But businesswoman Corcoran wants you to remember that this feeling is just an illusion. When you work for yourself, you’re in charge. Once you embrace the reality that you can create your own rules, you’ll likely make more progress — and probably enjoy your work more, too. 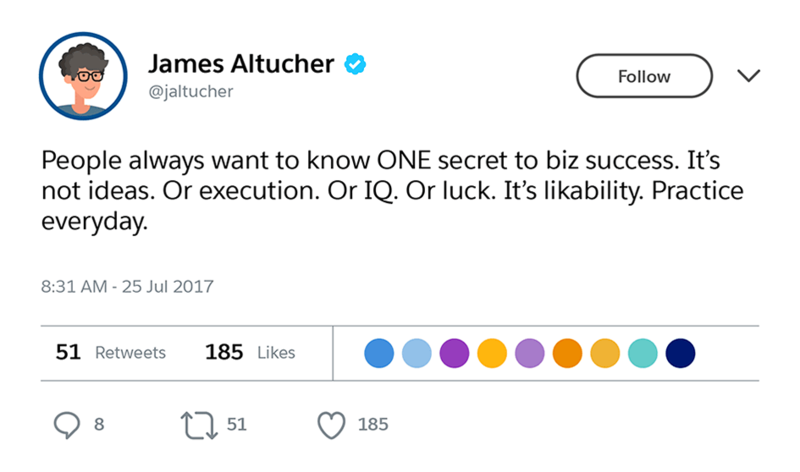 As a serial entrepreneur and angel investor, James Altucher shares that building a successful business isn’t easy, but there’s no reason to make it harder than it has to be. Goals, strategies, tools, and technical skills are all important to your business’ success, but so are soft skills. Generosity, a good sense of humour, and the ability to put people at ease can sometimes be among the most important business tools in your arsenal. Don’t ignore practicality, but don’t neglect the human side of your business, either. 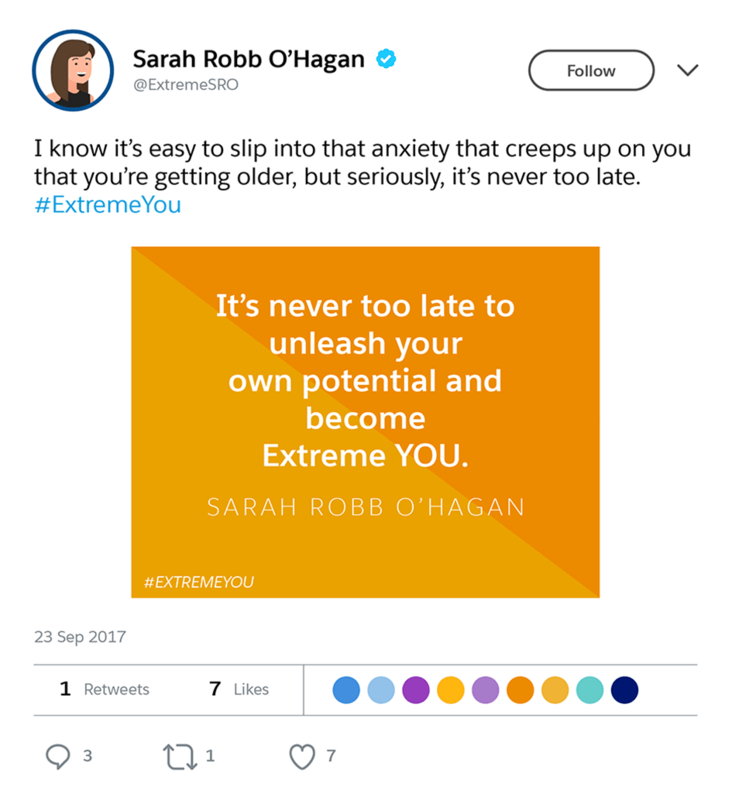 Sarah Robb O’Hagan knows business. She’s the CEO of Flywhell and the former president of Equinox and Gatorade, and cut her teeth at Virgin and Nike. 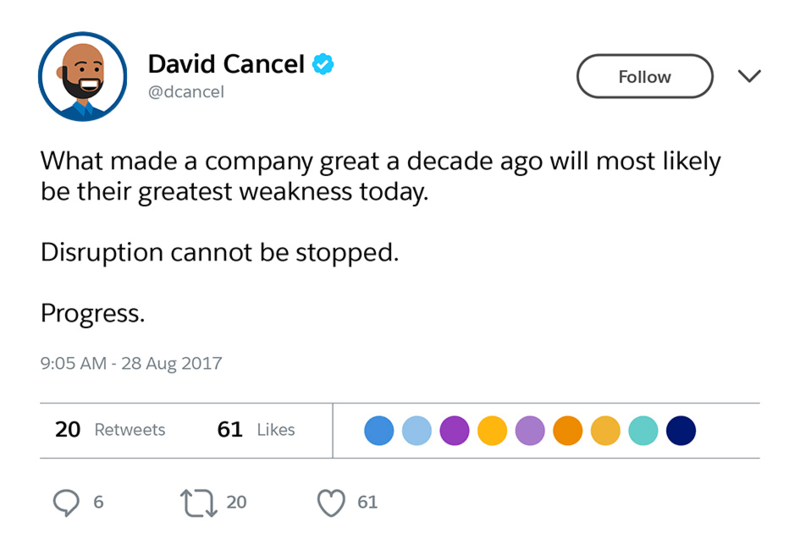 This tweet speaks to potential entrepreneurs who may be hesitant about reinventing their careers or starting their own companies. Age doesn’t matter when you have a great idea. “Luck” is a bit of a misnomer, especially in the business world. 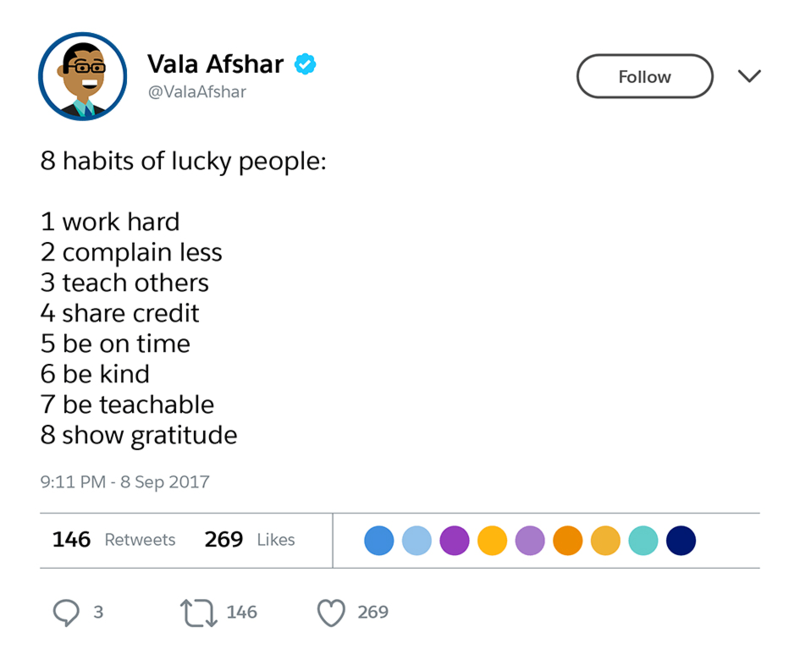 Vala Afshar of Salesforce has tips for increasing your odds of getting a lucky break, and none of them involve waiting for good fortune to show up on your doorstep. In a nutshell, he advises his followers to be humble, be a team player, and give credit where it’s due. These tips are timeless and universal. They apply to any field, and they’ll be just as true in a decade as they are now. As a consultant who helps business owners find their voice and get started online, Ash Ambirge isn’t afraid to speak her mind. 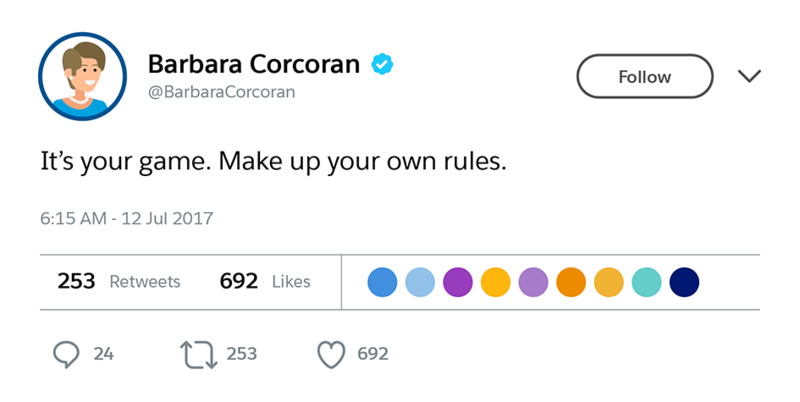 This quick tweet is one of her most concise pieces of advice, and it’s true for all businesses. Satisfying customers, ensuring a great company culture, and growing a healthy business is hard. Keep chipping away at it, and you’re likely to see your hard work pay off. Content marketing is a major part of any company’s marketing strategy, and it’s only getting bigger. But creating content for its own sake won’t necessarily help your business; customers can tell when you phone it in. 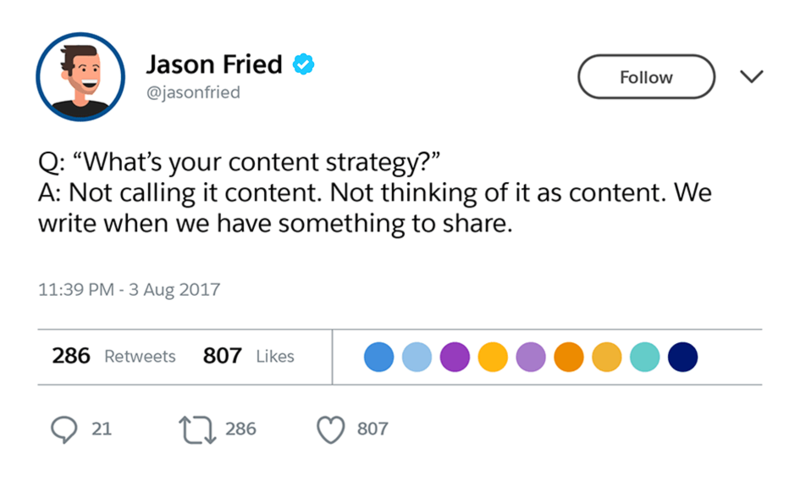 This tweet from Jason Fried of Basecamp nails the core of what makes a piece of content worth creating: It should be interesting, useful, or valuable. The lesson? Let your passion and your excitement, not necessarily your editorial calendar, fuel your content creation. 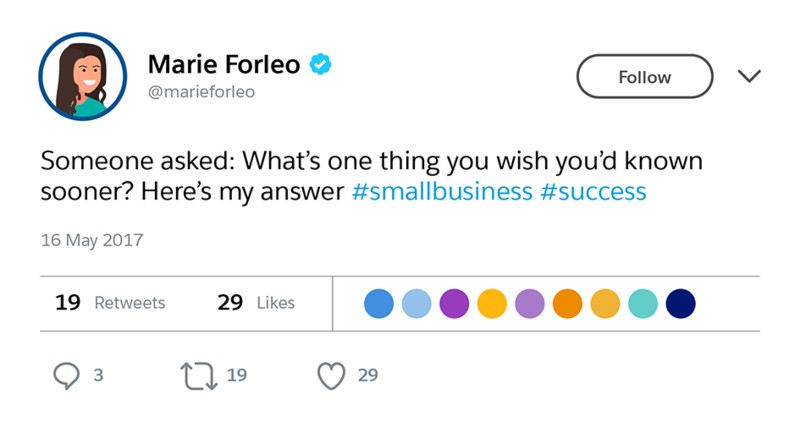 On its own, this tweet from entrepreneur and consultant Marie Forleo may not seem like much. However, click the link she shared and you’re taken to her video blog post on the topic of her question — and a discussion with over 500 comments. The blog and resulting comments are sure to help businesspeople feel like they’re part of a special community, and may help them find a few solutions, too. Making progress with your business — or, for that matter, progress in any area of life — can, at times, seem overwhelming or even impossible. Changes happen quickly, you may feel like you’re out of your depth, and it’s easy to get discouraged. This tweet from entrepreneur and motivational speaker Tony Robbins highlights the importance of adapting to change and growth. You don’t have to know everything right now, and you don’t have to come up with a winning strategy overnight. Push yourself a little further every day, and eventually you’ll get where you need to go. 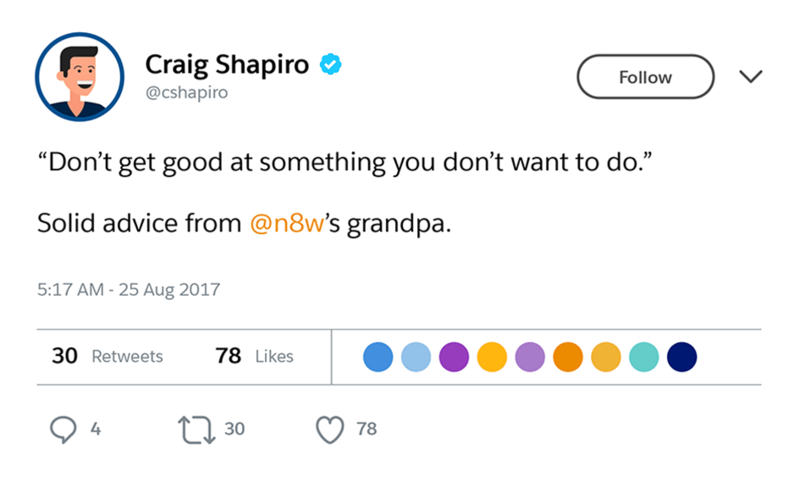 Craig Shapiro, the founder and managing partner of Collaborative Fund, which invests in startups, shares this gem. If you’re not completely clear on your mission, values, or goals for your business, you risk letting your business run off course. Stay on track by asking yourself what you want to spend your days doing and what kind of contribution you want to make to the world. Then put your energy toward making that happen, and say no to the opportunities that aren’t right for you. Social media is a goldmine for useful information about your field as well as general business wisdom. If you’re not currently using Twitter and other platforms to stay connected with influencers in your field, you may be out of the loop. Luckily, this is easy to fix, and with a little research, you can find the thought leaders and accounts that pique your interest. The one thing you shouldn’t do is dive into social media and try to keep up with everything by yourself. Twitter and other popular social media platforms can be a deluge of information, and manually sorting through it takes a lot of time and energy, especially if you’re just getting started with your social media presence. Instead, you can use a tool that’s built for organizing social media. Social listening tools, for example, can be a major help when it comes to monitoring what people are saying about your business and your industry. They’re also a great way to find out which thought leaders in your field are worth your attention. Once you’ve identified and followed the thought leaders in your industry, don’t be afraid to reach out to them every now and then. Twitter in particular is great for networking. Comment on tweets that interest you, or ask a question that pertains to an influencer’s area of expertise. Over time, you’ll start building a relationship. As your own reputation grows, you may even start being regarded as an influencer yourself. 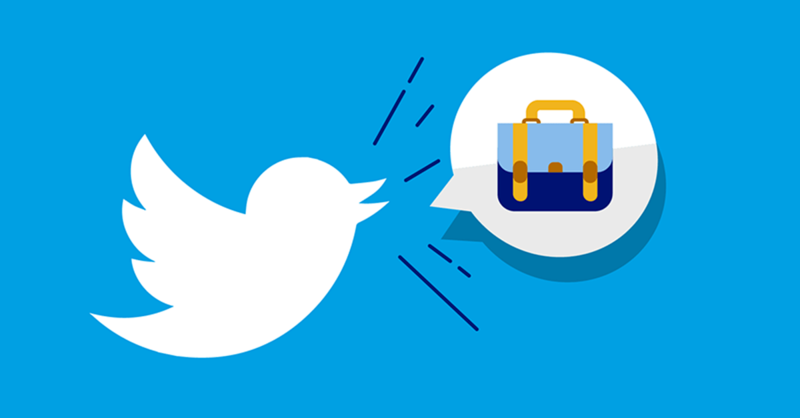 If you need some inspiration for your business, spend some time on Twitter. Check out the feeds for the leaders listed above. Twitter is full of creative and driven people just like them who share knowledge and wisdom with the world, 140 characters (or more) at a time. While you’re at it, use social media to stay connected to the top players in your field, and learn from what they share with their followers online.